PHOENIX - Animal lovers threatened to pull donations to an animal rescue group and the public flooded the agency with scathing comments and calls after a man's cat was euthanized when he couldn't afford its medical care, prompting the Arizona Humane Society to go into damage-control mode Wednesday. The group has hired a publicist, removed dozens of comments on its Facebook page and directed a team of five volunteers to respond to the overwhelming calls and emails it has received since The Arizona Republic published a weekend story about Daniel Dockery and his 9-month-old cat, Scruffy. 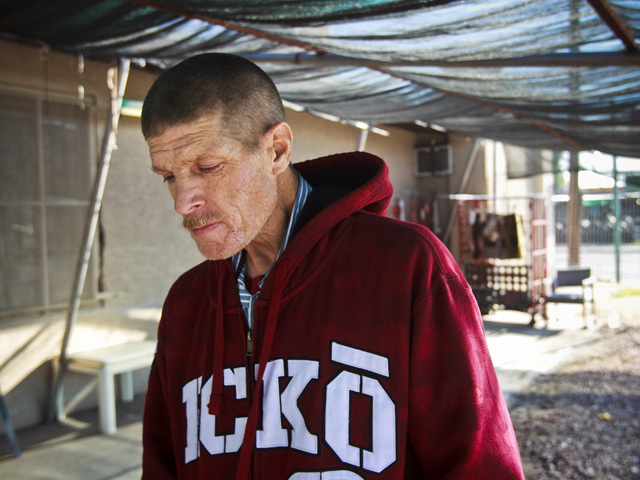 Dockery, a 49-year-old recovering heroin addict, told the Phoenix newspaper that he took Scruffy to a Humane Society center on Dec. 8 because she had a cut from a barbed-wire fence, an injury that he described as non-life-threatening. The agency said it would cost $400 to treat Scruffy, money he didn't have. The Humane Society cited policy when it declined to accept a credit card over the phone from Dockery's mother in Michigan or to wait for her to wire the money. The staff said if he signed papers surrendering the cat, Scruffy would be treated and put in foster care, he said. Instead, Scruffy was euthanized several hours later. Dockery told the Republic that he was devastated. "Now I've got to think about how I failed that beautiful animal," Dockery said. "I failed her. ... That's so wrong. There was no reason for her not to be treated." He described the cat as helping him stay off drugs for more than a year, the longest he had ever been clean. He hand-fed the feline before she opened her eyes at 4 days old, giving her fresh tuna and letting her sleep on his pillow. Stacy Pearson, who was hired by the agency specifically to deal with media questions about the cat, said Dockery's case has led to two changes. The Arizona Humane Society has set up an account, funded through donations, that would cover the costs of emergency treatment of animals whose owners need a day or two to come up with money for payments. And the group is now accepting credit card payments by phone, Pearson said. Dozens of scathing comments have since inundated the group's Facebook page, with animal lovers demanding to know why the cat was put down. Pearson said angry comments were removed because of their content: One called for the staff to be euthanized, while another said what happened to Scruffy was murder. Pearson said Scruffy was put down over a number of reasons, including Dockery's lack of immediate funds, a lack of veterinarians to treat her and what Pearson described as a very serious cut on Scruffy from her abdomen to her knee that went to the muscle. She said the Arizona Humane Society at the time didn't accept credit card payments over the phone because of possible fraud and can't treat pets with only a promise from owners that they can pay the next day. She said staff had every intention of getting Scruffy the help she needed but the number of animals requiring help at the group's second-chance clinic was too much for the resources available. If Dockery had been able to pay, Scruffy would have been treated at the facility where he brought her, Pearson said. "There was no malicious intent to take Scruffy away from her father," Pearson said. "Pulling funding is only going to make a problem like this worse." On Facebook, where only the agency's executive director is allowed to post comments now, Guy Collison wrote that "Scruffy's story is heartbreaking, and underscores the worst-case-scenario of need eclipsing resources available." He said that his agency has always done what's best for animals. In less than an hour after his statement was posted, more than 100 people responded, with most slamming the agency and some defending it as doing the best it can with available resources. Pearson said the group told Dockery on Tuesday that when he's ready for another pet, he could come in and pick one out, but he declined, telling them: "No thanks."